Chinese energy saving industries investments will reach to 4 trillion Yuan in the coming years, which is very good for frequency inverter industry promotion. In accordance with new technologies development all the time, it will enable industry convergence of emerging technologies to develop a new generation of inverters. Environmental protection forces us to increase investment in environmental protection industries. On technical level, the frequency inverter speed control function makes it has pretty good energy saving efficiency, to make the frequency inverter markets and technologies in rapid expansion. Since energy saving and environmental protection to be our core value of industrial economic development, which stimulates the sustainable development of Chinese frequency inverter industry effectively, to make China inverter drives industry continues expanding to various markets, And become an important basis point of China industrial development. However, despite Chinese frequency inverter industry the rapid development, the industrial overall strength and size are unevenness, less competitive strength and other potential drawbacks become China inverter industry killer during high economic growth. Industrial intelligence management and energy saving requirements to make the frequency inverters being used in more and more applications. Single phase inverter normally is for small power electric motor speed adjustment applications, with single phase 220V to 240V input to three phase voltage output (lower than input voltage), due to the compact design, this type of frequency inverters can be installed in a small space easily. 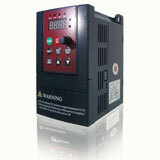 High quality frequency inverters for electric motor speed controls in energy-saving solutions. 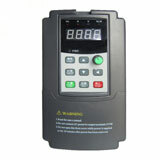 What is a frequency inverter? Why AC motor needs a Frequency Converter?